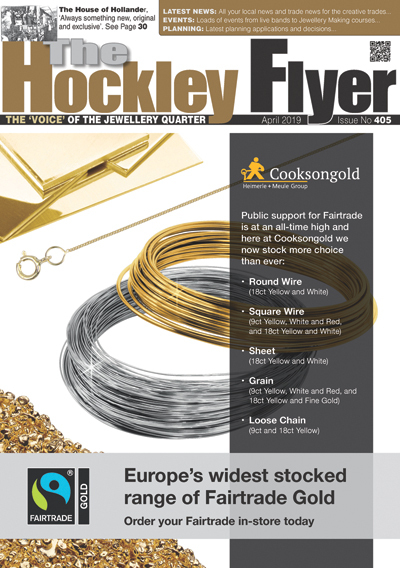 Cooksongold, the UK’s largest jewellery making supplier, is celebrating 100 years of being at the. Henry Deakin has been named as IoD West Midlands Director of the Year 2018 in. Weston Beamor will be giving a stimulating week of work experience, including access to jewellery. This year marked the tenth anniversary of Charles Green’s ‘live project’ at the School of. Award-winning Birmingham-based jewellery manufacturer Hockley Mint will offer its customers free hallmarking on any same-day. After 230 years of designing and manufacturing the finest cufflinks and accessories, Deakin & Francis. WB The Creative Jewellery Group was delighted to welcome his Royal Highness the Duke of. The latest offering from British based designers & manufacturers, Deakin & Francis, are sure to. Katy Tromans, a 3D print and CAD technician at Weston Beamor, is a woman of. Hockley Mint will mark its 25th year in business in 2017, and is set to. The Jewellery Quarter based fine jewellery and bridal manufacturer Hockley Mint has launched an initiative. Award-winning fine and bridal jewellery manufacturer Hockley Mint welcomed Peruvian Fairtrade gold miners to its. Members of the Conservative party are it seems great fans of UFOs – however not. Previously of 37/38 Icknield Street On 21 July 2016 the company of Bayliss Ormerod &. British jewellery manufacturer Hockley Mint announces the launch of its ‘Inside Hockley Mint’ series –. Assay Office Birmingham has raised over £8,600 for Birmingham Children’s Hospital Charity through the building. The School of Jewellery has announced its short course programme for 2016, and particularly of. (Follow-on from April’s News Item) The Birmingham Assay Office invited people from the Trade to. ‘A Guarantee of Fineness of Precious Metal’ – not ‘A Source of Origin of Manufacture’. The Guildsman Jewellery Gallery, situated in Spencer Street, is a brand new retail destination, dedicated. Assay Office Birmingham wanted a bold Anchor – the AOB’s long-time emblem – to stand. Assay Office Birmingham has launched a video that follows its relocation to its new state-of-the-art. To celebrate his 10th anniversary as a jewellery designer, Fei Liu auctioned four pieces of. The new AnchorCert Academy space at Assay Office Birmingham will host an evening of topical. Again this year Betts Metal Sales of Spencer Street held a Coffee Morning and. Josephine Aguti to meet the team at leading Birmingham jewellery business Hockley Mint, which is. Assay Office Birmingham is celebrating the news that leading designers from the Jewellery Quarter have. Two of the city’s oldest family businesses made history In September 2015, by joining forces. Assay Office Birmingham’s independent, world-class AnchorCert Gem Lab searches for rising gemmological stars! Following its. As part of its recent relocation from Newhall Street to Moreton Street, Assay Office Birmingham.